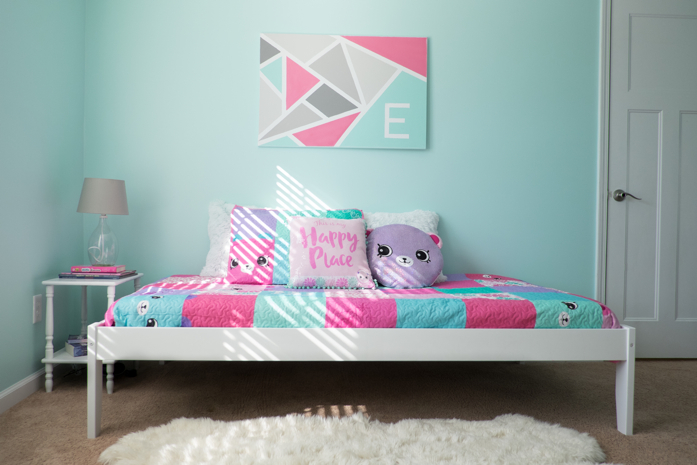 Pastel colors reign in this lovely girls bedroom. Recently my friend's daughter, Evie, opted to make over her bedroom for her birthday. She chose this lovely pastel color for her wall which really makes the white furniture pop. 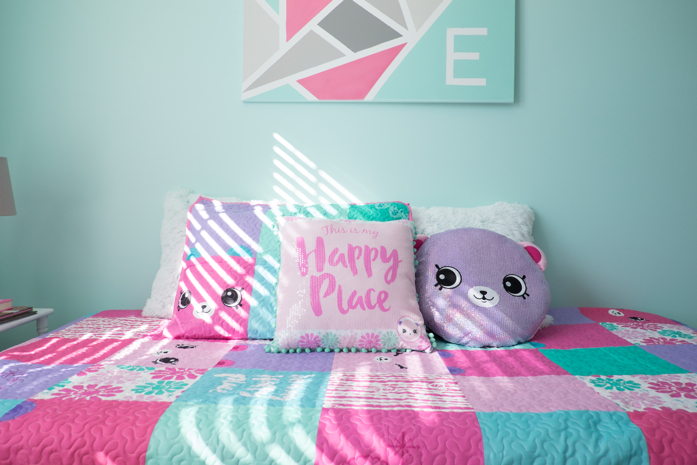 A few days ago, while she was in school, I added and styled her bed with this whimsical quilt and pillows from the Happy Places Shopkin Bedroom Collection that I was gifted from the kind folks at Moose Toys. The colors in the pillow and quilt go so perfectly with the wall color, you'd think they were the inspiration for the room design. The Happy Places Shopkin Bedroom Collection is available exclusively at Target. So pretty, right? Evie was so thrilled about her surprise pieces from the Happy Shopkin Bedroom collection when she came home from school. Btw, I'd also like to add that Evie's Mom, Lea(who is also the talented photographer i work with all the time), made that beautiful piece of art above the bed. She taped off a canvas to form that design and used left over paint from various projects to paint the different areas-such a genius idea! * Although I was gifted these pieces, the opinions expressed in this post are 100% my own. What a sweetheart you are, and how beautiful this room is! I really love everything about it. So bright and cheerful. Browse our Inspirations page to find out what inspired the interior wall design on our website. Contact us to discuss how we can help you achieve your dream home!